Located on the northern end of Vancouver Island, Port Hardy is built along the shores of a natural deep water harbour. Hardy Bay overlooks the Queen Charlotte Straits and the mainland where the snow capped peaks of the BC Coastal Mountain Range loom in breathtaking splendour. The community is bordered on the east by water and on the west by the foothills of the Vancouver Island Mountain Range. The area is rich in beauty and natural resources, and is the largest of communities in the Regional District of Mt. Waddington. The mountains, rivers, lakes, forests and the marine environment provide an ideal setting to live work or play. Port Hardy is accessible via major transportation networks of road, air and water, and serves as the gateway to the fast-growing Central Coast and Prince Rupert. Port Hardy is accessible by major highway, commercial air, ferry, and a local bus service. As the largest community within the Regional District of Mt. Waddington, Port Hardy serves as the transportation hub for the fast growing Central Coast and as the gateway to the Inside Passage and Prince Rupert. Highway 19 is the main highway serving Vancouver Island. This busy thorough fare links Port Hardy with Victoria and all other major centres on the island. Other communities in the North Island, including Coal Harbour, Holberg and Port Alice, are connected to Port Hardy by well-maintained highways. At the northern tip of the island, a network of publicly accessible logging roads has opened up wilderness areas on the west coast and provides access to Winter Harbour and Cape Scott and Raft Cove Provincial Parks. Mt. Waddington Regional Transit (local bus service), BC transit provides a local bus service for Port Hardy and the rest of the surrounding region, including Port Hardy, Port McNeill, Fort Rupert, Coal Harbour, Hyde Creek and Woss. Schedules and fares can be found at the local Visitor Information Center and online at www.bctransit.com/regions/mtw. Or, for more information, call 250-956-3151. Port Hardy has a fully-serviced, all-weather airport, owned and operated by Transport Canada. The airport has three runways and is equipped to handle both domestic and international carriers. Scheduled service is available to Vancouver International Airport, as well as to points on the Central Coast, including Bella Bella, Klemtu and Prince Rupert. Airlines include: Pacific Coastal Airlines and Vancouver Island Helicopters. Both jet and aviation fuel are available. Port Hardy has several daily direct flights to Vancouver International Airport (YVR) which is a major international airport. Annual air cargo volumes exceed 250,000 tons and over 40 air carriers serve the airport. Cargo spokes include over 18 international and 27 United States direct service connections. The Port Hardy Seaplane Base has been constructed in the inner harbour. It provides state-of-the-art facilities for float planes in an area that is sheltered from winds. Inner Hardy Bay is noted on the Coast for being free of fog conditions when everywhere else is socked in. 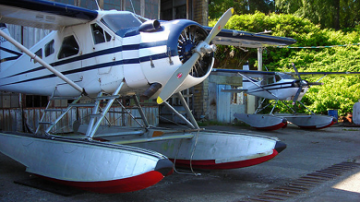 The seaplane base is a valuable addition to transportation facilities in Port Hardy. For more information on the seaplane base, call 250-949-6156. BC Ferry Corporation is one of the three largest ferry companies in the world. Port Hardy is the southern terminus for the BC Ferry route to Prince Rupert and the Central Coast, with connections to the Queen Charlotte Islands and Alaska. The ferry runs on alternate days between June and September and once a week during the winter season, October through May. Port Hardy hosts three municipal wharves and a private marina, as well as offering a fuelling facility for marine vessels. More information about the municipal wharves is found under the Harbour Authority section of the website. The Quarterdeck Marina is large private marina that offers a full range of services, including boat repair and a 60-ton travel lift. The Marina offers 1150 m of floats, creating 195 slips. There is new moorage for vessels up to 150’ which offers 15-, 30-, and 50-amp power, and water. A modern hotel and restaurant are located adjacent to the marina. The Chevron fuel receiving facility is located at Bear Cove on the eastern shore of Hardy Bay. This facility is equipped with sturdy mooring dolphins which are capable of handling large coastal vessels (with a maximum displacement of 10,000 tons), such as the Canadian Coast Guard vessels which re-fuel here. The dock has a depth of 8m. at zero tide.